Minutes ago, the Syrian Arab Army (SAA) followed up on earlier gains in the day by liberating an additional two villages during clashes with ISIS in the eastern Aleppo countryside. Effectively, the SAA’s Tiger Forces were able to impose full control over the villages of Nbatah Kberah (Tafriyat al-Kabeera), and Nbatah Sgerah (Khirbat adh Dhib). Thus, Syrian government forces are just 8 kilometers from linking up with the non-hostile Kurdish-led ‘Syrian Democratic Forces’ (SDF) near Manbij. Meanwhile, fresh skirmishes erupted between the Turkish-backed Euphrates Shield forces and the SAA on the outskirts of Al-Bab. Turkish troops were also involved in the clashes that have thrown two hostile national armies at each other’s throats. The Turkish Armed Forces claimed to have killed 22 Syrian soldiers in and around Tadef; however, field correspondent Yusha Yuseef confirmed to Al-Masdar News that these casualty claims were grossly exaggerated. SAA troops stationed at Tadef are just one kilometer from Al-Bab and may use the town as a launching pad towards the Turkish-held city. Click here for a full HD version of the map. How dare the Turk aggressors attack and kill SAA men in Tardef? p.s. Tardef was taken by SAA from IS. The Turks attack the SAA. While al-Bab was taken by the Turks. Where the SAA did not attack. Turks bombs, Assad took it. How noble! @ Oğuz, akhi, the Türk Ordusu and their mercenaries only took al-Bab because the SAA cut it off in the South and IS had to strategically withdraw. Before that IS gave the Turk headed attackers from North a good licking. How noble of the Assadist! What? Should Turkish Army let SAA to take over al Bab just because SAA cut the supply lines of IS. Does SAA want a share because of all the effort of cutting supply lines? What is done is done. Talking has no meaning now. Kardeş, I did not say that. What it means: the Türk Ordusu were not capable to take al-Bab alone. 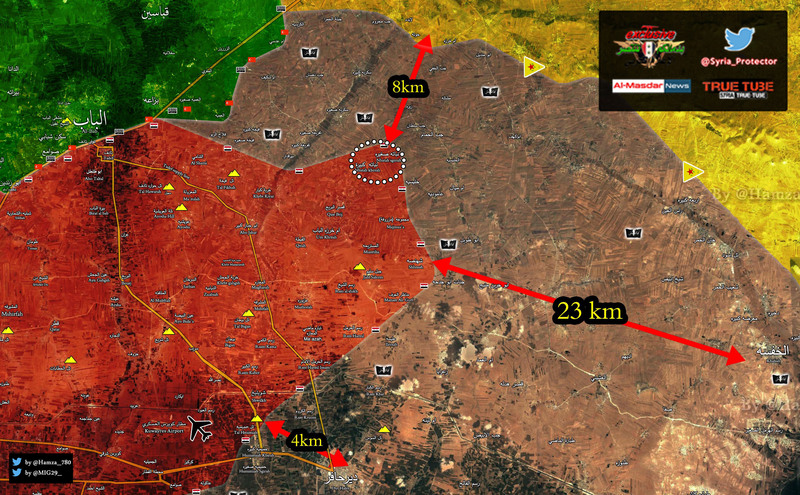 They needed the SAA to force the IS into a strategic retreat. All their big talk of taking al-Bab is void. Close the road to Turkey ASAP. This changes the situation about which we talked. Erdogan attacks. No more restraint. The Turk troops are in Syria illegally. Did the Turkish forces suffer any losses? Syria needs to defend itself to the utmost against the Turks. Ya habrá respuesta militar pero lo mas urgente es enlazar con dominios de SDF y si es posible buscar alianza para expulsar a los mercenarios del territorio Sirio.